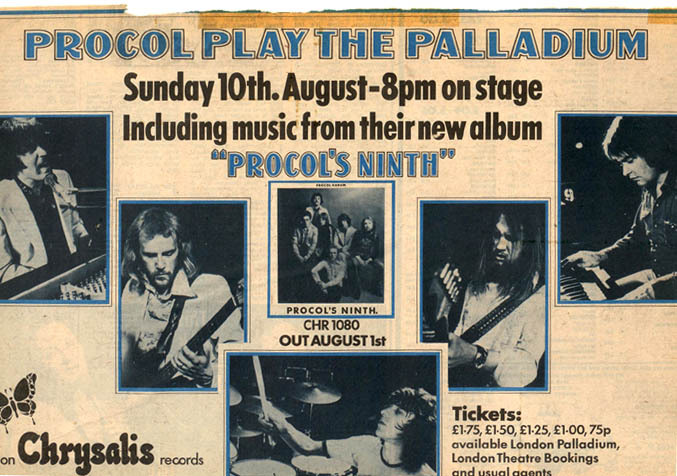 10th of August 1975 ... my birthday, and what better way to spend it than in the company of Procol Harum? It didn't start too well. We got to our seats to find a mixing desk there. We were given copies of Procol's Ninth and escorted to alternative, but just as good seats. MC Viv Stanshall kicked off the proceedings and as the curtains rose Piggy Pig Pig filled the hall. A strong first half with Still There'll Be More, As Strong As Samson, Cerdes and offerings from the new album (namely Typewriter Torment and The Final Thrust). Adagio followed whilst Power Failure went into the interval. There was a lot of up-tempo stuff in Part 2. Toujours L'Amour, Butterfly Boys, Unquiet Zone. Phew it was all quite frantic. That 'touring song' slowed things down. Viv Stanshall come out for 'Saturday Night At The London Palladium' in the middle section. Procol played all of Procol's Ninth with the exception of Taking The Time: Sharp, snappy numbers that had the place rocking. Just to put everyone in their place The Blue Danube was thrown in for good measure. 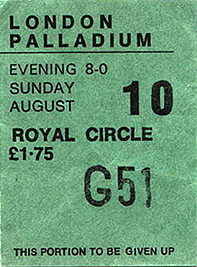 The audience reception was such that Procol were called back for two encores: Drunk Again / Old Black Joe, Eight days A Week / A Whiter Shade of Pale. Whilst Procol's Ninth came out to mixed reviews, Pandora's Box was riding high, there were live performances on Top of the Pops and even The Final Thrust live on Supersonic.